Erik, Sarah, Julien, Benoit, Jordane and Nicolas, 6 employees from the Lille region, want to team up with the Sport Dans La Ville association, which helps young people from troubled neighbourhoods to reintegrate through sport, to offer new sports activities: Nordic walking and race walking. Each one of them will mentor a young person to support them in their career. 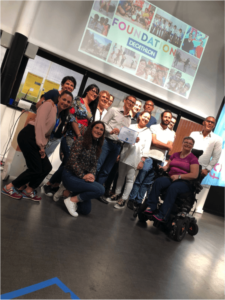 The teams at the Taichung store (Taiwan) submitted a project to the foundation to help disabled people with the Maria Social Welfare Foundation. During the project, 21 people will be helped to run a half-marathon while also gaining experience at Decathlon. 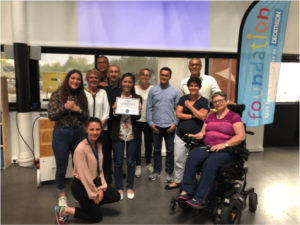 The teams at the Odysseum store (Montpellier) decided to build a project with the Ligue contre l'obésité association, a French anti-obesity charity. They had the idea of creating fitness trails in the city using existing infrastructure. The aim is to enable obese people to make exercise part of their daily life. 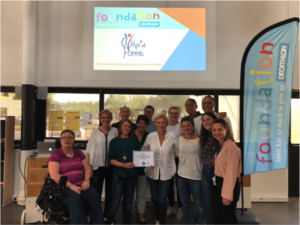 Each week, yoga and Nordic walking activities will be organised by the store teams in order to build a relationship with the association's beneficiaries. Staff from Outshock (Decathlon's boxing brand) wanted to support a brand new boxing association. 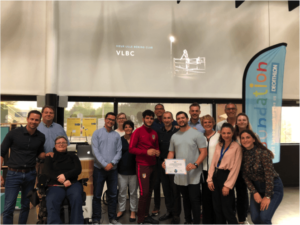 With the support of the Vieux Lille community centre, this association uses boxing as a way to encourage young people in difficulty to achieve academic success.